If you’re like me, you have a very special relationship with your snooze button. It never fails, every morning when the alarm goes off, I tap my morning away 9 minutes at a time. The next thing you know: I’m rushing around trying to get caught up on where I need to be to keep my day on track – regretting all of those simple, blissful taps of the wonderous button of snooze. British inventor, Colin Furze, has a solution to my problem. 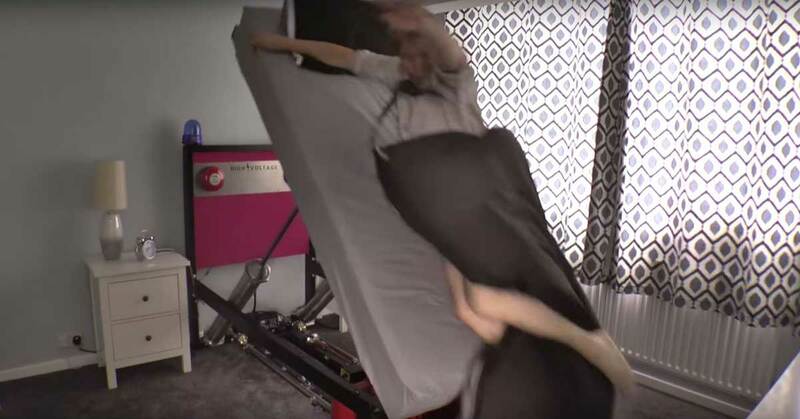 With the use of an air compressor, some homemade pistons, flashing lights, and a couple of car horns – he has made the “High Voltage Ejector Bed”. No snooze button here. Just a blast of air through the pistons that, quite literally, throw you out of bed. Furze, who’s background as a plumber, lead to him to hosting popular TV shows about gadgets of all kinds. He got the inspiration for the ejector bed from fans of his youtube channel and sponsorship from the Taylors of Harrogate coffee company. Furze’s inventions are just crazy enough to be absolutely brilliant. I don’t know about you, but I would order one of these as soon as they came available.